While lacrosse is American’s oldest game, it may be the “freshest” sport in the nation as well. Its unique blend of fast-paced, high-scoring, hard-hitting action has made it the fast growing team sport in the United States. Major League Lacrosse was launched in June 2001 as a single entity ownership structure to showcase the best professional outdoor lacrosse in the world. MLL was founded by Jake “Body by Jake” Steinfeld with founding partners Dave Morrow and Tim Robertson. The MLL has nine teams playing in major markets across the United States. 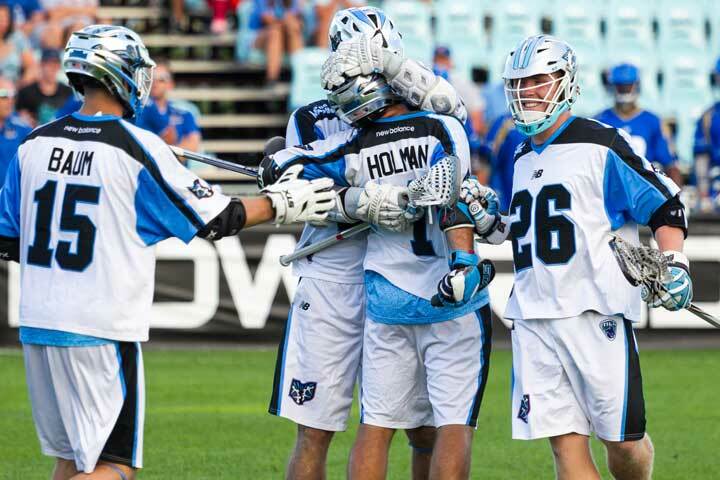 MLL teams play 14 regular season games (seven home and seven away) that begin in late April and run through August, including an All-Star game, Semi-final and Championship, where the top-four teams play for top honors. Each team, consisting of 25 players, has three attacks, three midfielders, three defensemen and a goaltender on the field during the game. Each team dresses nineteen players and the players rotate on and off the field in shifts. The game consists of four 15 minute quarters. TIME FORMAT: Games consist four 15 minute quarters, including a 15-minute halftime period. FACEOFFS: to determine possession of the ball at the start of each quarter and after every goal. Two players face their sticks at the midfield with a referee placing the ball between the heads of the stick. SHOT CLOCK: Changed from a 45-second shot clock in 2006, a 60-second shot clock when a team gains possession of the ball. The offensive team must put a shot on goal during that time or they will lose possession. The clock is reset for a new 60 seconds if the offensive team takes a shot without scoring but recovers the ball. SLOW WHISTLE (DELAYED PENALTY): If defending a player commits a minor or major penalty against an opponent in possession of the ball where there are offensive momentum and the opponent doesn’t lose possession, the official raises his hand and does not blow the whistle until the shot is taken, the 60-second shot clock expires or a goal is scored or possession is lost. 2-POINT ARC: The 16-yard radius from the center of the goal line from which goals are worth two points. Also, the line which players have to remain until the faceoff is possessed. BALL: The ball is colored fluorescent orange and is textured, making it less weather sensitive and gives the players a better feel for the ball In the stick pocket. The orange ball helps fans follow the game and enhances televised games by making them more viewer friendly. ATTACK: The attackman’s responsibility is to score goals. The attackman generally restricts his play to the offensive end of the field. MIDFIELD: The midfielder’s responsibility is to cover the entire field, playing both offense and defense. The midfielder is key to the transition of the game and is often called upon to clear the ball from defense to offense. DEFENSE: The defenseman’s responsibility is to defend the goal. The defense generally sticks to the defensive end of the field. A good defenseman should be able to react quickly in game situations. GOALIE: The goalie’s responsibility is to protect the goal and stop the opposing team from scoring. A good goalie also leads the defense by reading the situation and directing the defensemen to react. BODY CHECK: Defensive move used to slow an opponent who has the ball; must be above the waist and below the neck. CRADLE: Method used to keep the ball inside the pocket of the stick by rocking it back and forth. CREASE: The nine-foot radius containing the goal in which offensive players cannot enter. Shooters or their teammates cannot stand on (or inside) the line or their goals won’t count. GROUNDBALL: Occurs when there is no possession and the ball is bouncing, rolling, or deflected off the goaltender. OUTLET PASS: The first pass from the goaltender that begins the transition from defense to offense. RIDE OR RIDING: Defending a clear; an attempt to stop the team in possession from clearing the ball. ROLL DODGE: Typical of an attackman’s move; driving with the stick on one hand, while the rolling back to the defender to free hands for a pass or shot on goal. SHOT CLOCK VIOLATION: Failure to get a shot on goal – whether it hits the post, rebounds off the goalkeeper or is saved by a defensive player in the crease – in 60 seconds. SPLIT DODGE: When an offensive player with the ball changes direction by moving the stick from one hand to the other in a crossover motion, to lead the defender in the opposite direction. TAKEAWAY CHECK: An attempt to strip the offensive player off the ball using the defenseman’s stick.